Do you Play DoubleDown Casino - Free Slots? Join GameHunters.Club our members share free bonus, tips, guides & valid cheats or tricks if found working. 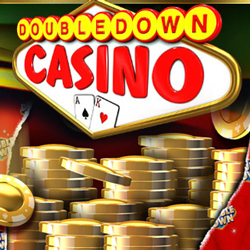 Check out the DoubleDown Casino - Free Slots Bonus page to see the full list. If you need to add friends for gifting or exchanging game-items you can check or join the DoubleDown Casino - Free Slots Add Me List. GameHunters.Club is a Fan Site and is not endorsed by or affiliated with DoubleDown Casino - Free Slots. All Trademarks are the property of respective owners. If you love this game, support it by purchasing premium items in the game or follow the official DoubleDown Casino - Free Slots social media channels. Join the Forum, Discuss anything about DoubleDown Casino - Free Slots. You can talk about tips, tricks, cheats, ask for help or simply introduce yourself to the club. These are the most recent topics and posts on DoubleDown Casino - Free Slots Forum. Do you know any of this topics? Help players by posting about this topics on DoubleDown Casino - Free Slots Game Post section. On the prowl for more chips? Then grab this Flash Giveaway! Claim 275,000 FREE chips by clicking https://bit.ly/2Uf4urw These chips must be claimed in the next 12 hours. Wishes do come true... Bonus Chips have arrived, just for you! Claim 225,000 FREE chips by clicking https://bit.ly/2Uh91JX There are still a few hours to earn your first entry in the Easter Egg Hunt. Have you collected 65 spins in Solar Disc? Every challenge you complete through 4/20 means a bigger reward on Easter morning! Congratulations to the 25 winners in our Feline Fortune giveaway! The lucky names below have just won 250,000,000 chips each. Please remember, we have millions of players and there are lots of common names! Just because you see “Allison S” as an example, it doesn’t mean that every Allison S in the game won. We’re simply unable to list the individual last names/locations for each player, due to legal and privacy requirements. So please check your email! We hope you had lots o...f fun during this giveaway! Get your Sunday into a paws-itive space with 300,000 FREE chips by clicking https://bit.ly/2FCpZbP Ann C. Bethany D. Chris W. Christine C. Cyndi A. Heidi T.C. Hope R. Jen H.O. Jim Z. Joyce L. Juanita P. Linda B.C. Lorrie L. Lucy H. Marg V.P. Michael S.D. Pam C. Pat R. Richard B. Ron M. Stacy J. Sylvia W. Teresa M. Uwe W. Veronica P.